Texas Jack Omohundro poses with his wife and business partner, Italian ballerina Giuseppina Morlacchi, in this colorized publicity photo. It was probably taken shortly after the couple began their Texas Jack Combination acting troupe in 1876. 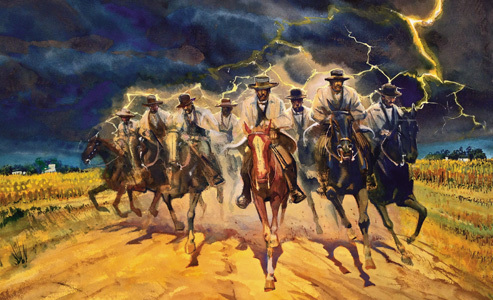 Texas Jack could have been the person about whom the phrase “tall, dark and handsome” was coined. And Giuseppina Morlacchi was a heartbreaker. She was a ballet dancer from Italy and he was a cowboy from Virginia. Born John Burwell Omohundro, he later decided that “Texas Jack” was a lot easier for people to remember, and pronounce. She moved to the United States at age 21 to perform and never left. Theirs became a fairy tale romance, forged in the imaginary West of the stage but eventually broken in the real West. 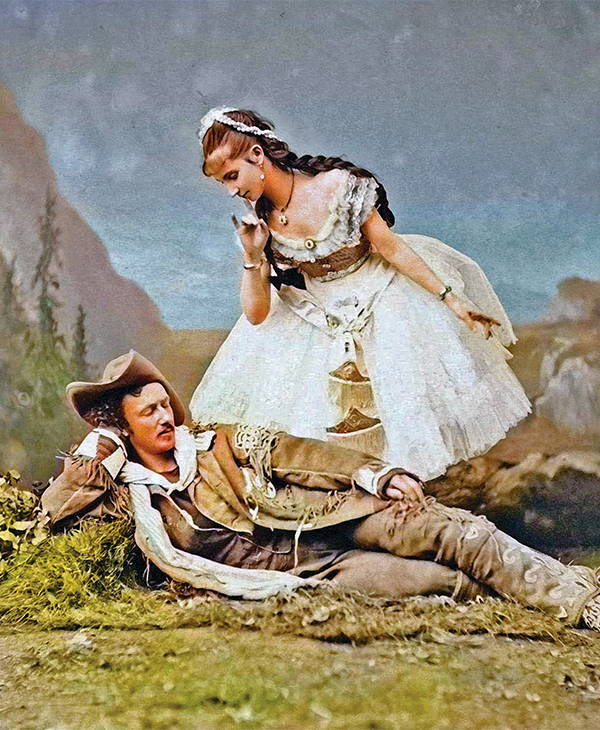 Former Confederate cavalryman Texas Jack Omohundro’s stage career and story book marriage to Italian ballerina Giuseppina Morlacchi were cut short by pneumonia in Leadville, Colorado, where he died in 1880 at the age of 33. 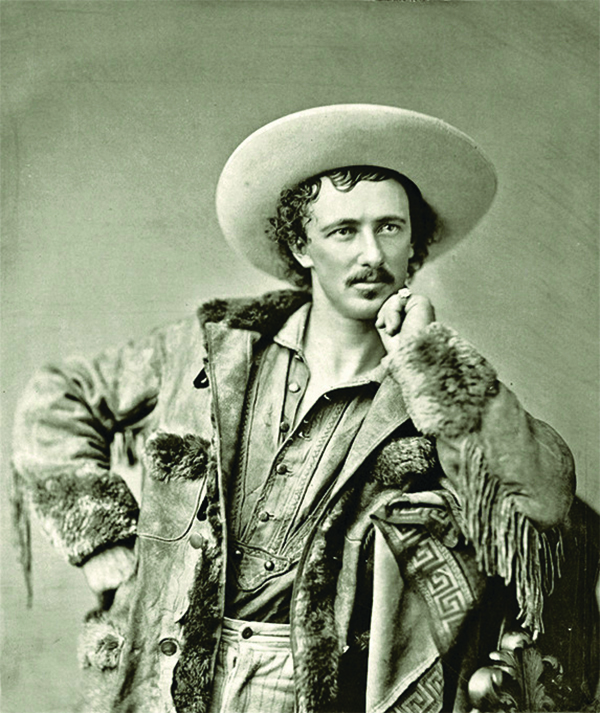 In 1869, Texas Jack met William F. “Buffalo Bill” Cody, who was also scratching out a living scouting, hunting and guiding. They became fast friends, scouting together for the Army and engaging in hunts with the likes of the Earl of Dunraven and Grand Duke Alexis of Russia. They also caught the attention of dime novelist Ned Buntline. In late 1872, their fortunes changed when he invited them to become stars of Scouts of the Prairie, a play he was creating. The cast was strengthened by the presence of the noted ballerina and actress Mademoiselle Giuseppina Morlacchi. This 1873 cast photo shows the stars of Scouts of the Prairie in their stage costumes. Buntline, Cody and Omohundro wear typical frontier scouting attire. Giuseppina Morlacchi has abandoned her ballerina outfit and wears the costume for her role as Dove Eye, an heroic Indian princess. Born in Italy, Morlacchi was the same age as Texas Jack and Buffalo Bill. She became a classically trained dancer, traveling throughout Europe until her American ballet debut in 1867. She introduced the can-can to the country the following year. A fine actress as well, she was soon appearing in the major cities of the American Northeast. Just weeks before his buffalo hunting expedition with Buffalo Bill and Texas Jack, the Grand Duke Alexis saw Morlacchi on stage. Buntline also saw her and recruited her to join his new play. 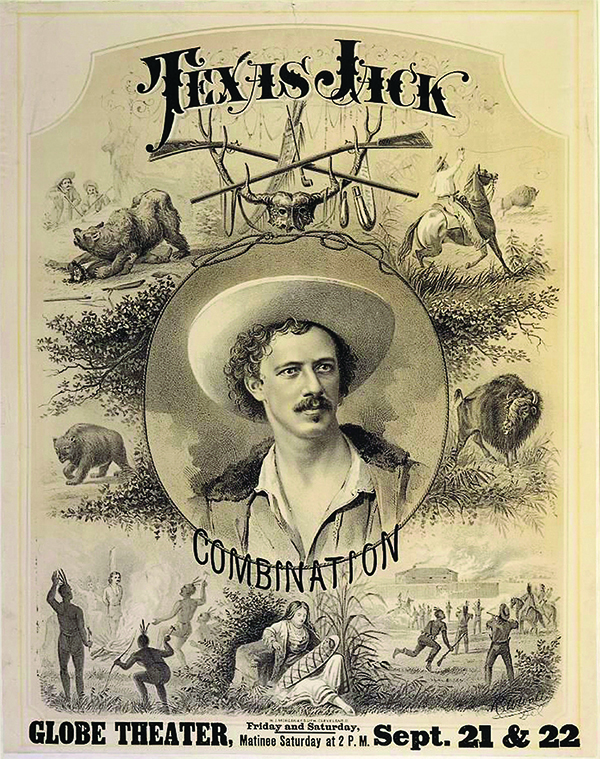 The Texas Jack Combination was successful for Giuseppina Morlacchi and Texas Jack, but they continued to perform separately as well. 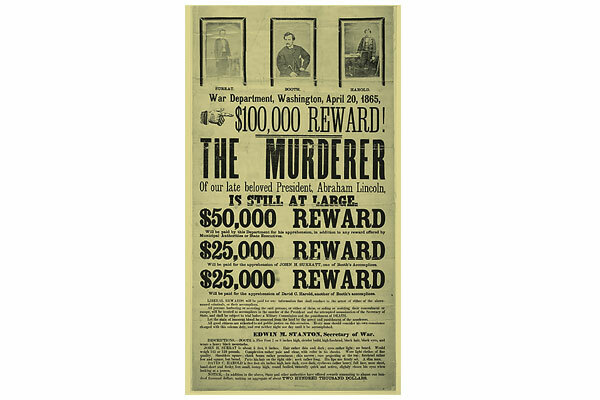 In 1878, Texas Jack appeared with Dr. W. F. “Doc” Carver, a dentist turned exhibition shooter who he met several years earlier in North Platte, Nebraska. 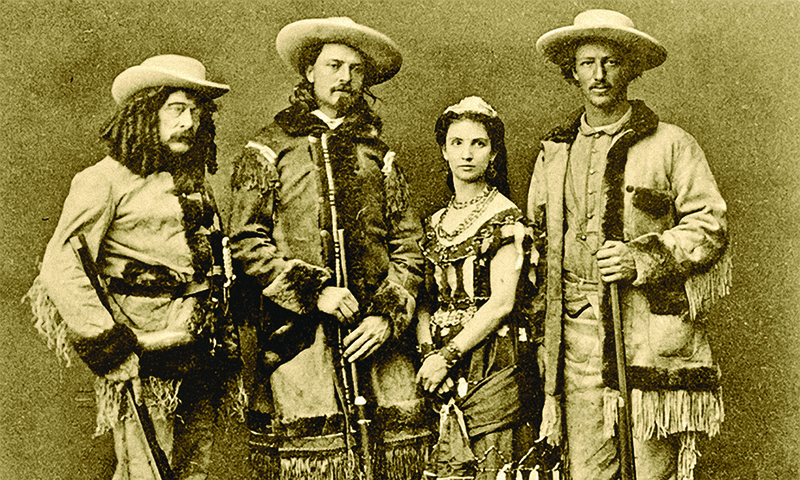 Five years later Carver joined forces with Buffalo Bill to create Buffalo Bill’s Wild West. Giuseppina did not come alone to the United States. She was accompanied by her manager of five years, John Burke, who was smitten by her. He had presented her with rings and was planning on settling down with her in a house in Lowell, Massachusetts. Those dreams ended when she met Texas Jack. For the Virginian and the Italian, it was love at first sight. She returned the rings to John Burke and pledged herself to John Omohundro. Heartbroken, Burke wore the rings and never married. Instead of devoting his life to her or to any another woman, he spent it instead promoting his new friend Buffalo Bill. It was a task he pursued until Cody’s death. in Chicago in December of 1872. 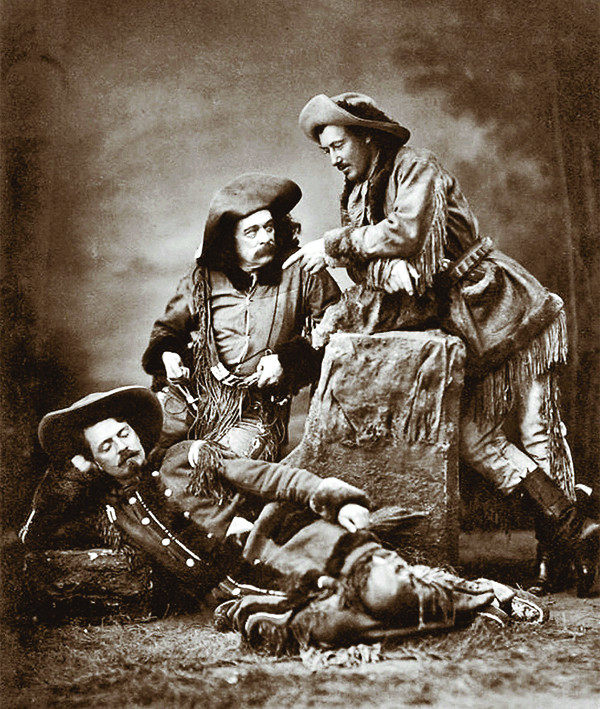 In this publicity photo, Texas Jack points at his friend William F. “Buffalo Bill” Cody, who reclines in front of Buntline. The play was the first appearance onstage for all three. With Scouts of the Prairie’s combination of the two well-known scouts with the lovely and talented Morlacchi, the 1872-73 season of the road show was a resounding success. The relationship between Morlacchi and Omohundro was also a success; they were wed on August 31, 1873. 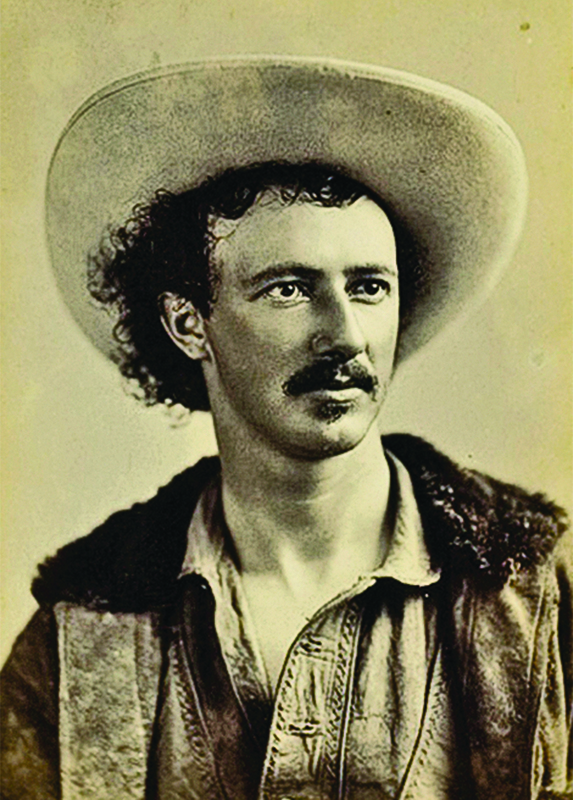 The following year Texas Jack, Morlacchi and Buffalo Bill struck out on their own with a new play, Scouts of the Plains, and a new co-star, their friend Wild Bill Hickok. 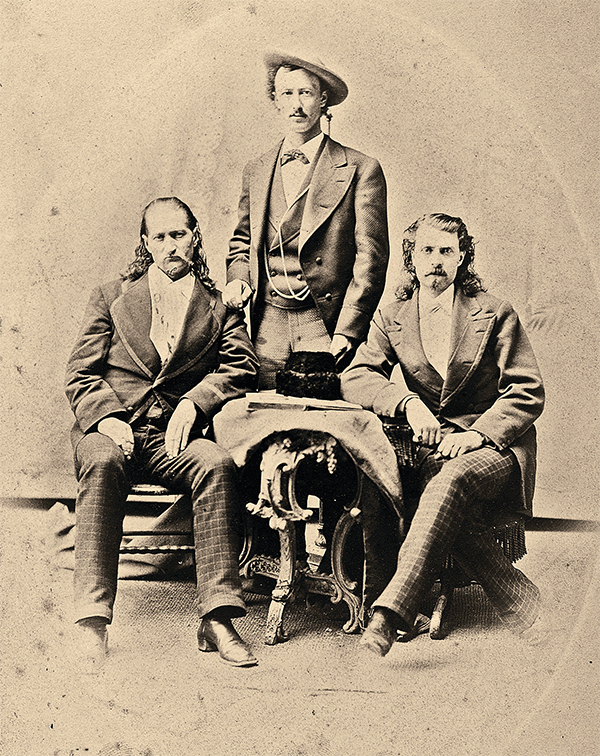 Texas Jack and Buffalo Bill pose with their friend “Wild Bill” Hickok. 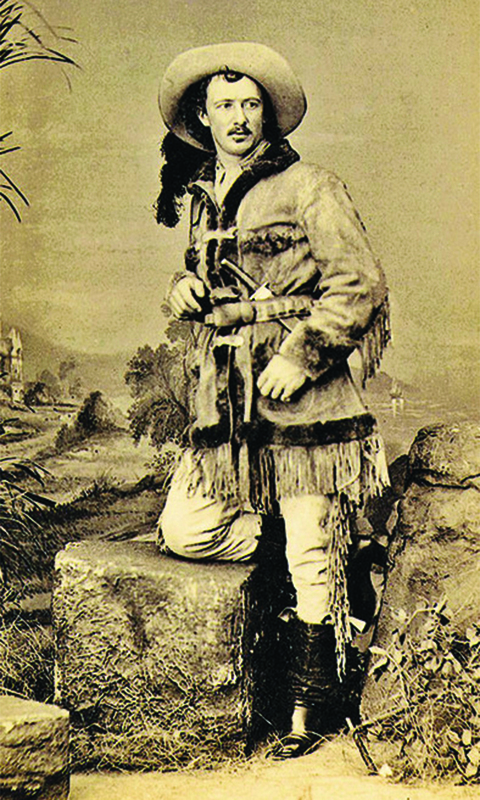 Hickok joined them onstage in the play Scouts of the Plains in 1873-74. He preferred gambling to acting and left the show mid-season. Hickok, who was never very excited about acting, was the first to leave the combination after several months. The Omohundros parted amicably with Buffalo Bill in 1876 to create their own troupe, re-enacting scenes from the West on stage. They happily toured together for the next several years, with periods of relaxation at the Massachusetts home once desired by John Burke. Finally their show business career took them to Leadville, Colorado, for a series of performances. They decided to stay in the Rocky Mountain West rather than return to Massachusetts. Three months into their stay, Texas Jack succumbed to pneumonia in Leadville, dying on June 28, 1880. The fairy tale romance had lasted just seven years. Grief stricken, Giuseppina Morlacchi departed for their Massachusetts home, never to return to the stage, and died of cancer six years later. Author’s Note: Texas Jack Omohundro is buried in Leadville’s Evergreen Cemetery. In 1908, Buffalo Bill commissioned a permanent granite marker in his friend’s honor. In 1994, Omohundro was inducted into the National Cowboy & Western Heritage Museum’s Hall of Great Western Performers. 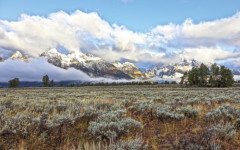 Owen Wister’s Wyoming Hit the road across the Cowboy State in search of Wister, Trampas, and The Virginian. The Great Northfield Raid Revisited New research that changes our understanding of the James-Younger debacle.